Quest Martial Arts provides martial arts instruction in Coral Springs, Florida. We’re more than martial arts. We inspire greatness. We all want our children to develop a strong character, marked by integrity, confidence, self-discipline, and unshakable resolve. We want to empower them to be self-reliant, rise above conflict, and have the ability to set lofty goals and accomplish them. For many parents, teaching these concepts is not an easy task, and our schools aren’t teaching these critical concepts either. Quest Martial Arts offers a proven program for youth of all ages that builds confidence, character, and accountability. Our program, based in Coral Springs, is more than self-defense and physical fitness. We partner with parents to provide children with a foundation of positive values that will serve them for a lifetime. Are you ready to see your child grow in self-confidence? Are you concerned about bullying? Do you believe your child has untapped leadership skills that need to be developed? Quest Martial Arts is the answer. Have you stood on the sidelines of your child’s soccer, baseball or basketball game and felt a sense of disconnect? Youth sports focus on participation, but parents’ only role seems to be to shuttle their children to and from games and cheer from the sidelines. Do you want more than team sports can offer? At Quest Martial Arts we welcome parent participation. In fact, it’s expected. Parents are encouraged to take classes along with their children, and each week’s lesson includes take-home material to help parents reinforce the concepts taught during instruction. In class, parents have as much fun as their kids, and at home, they are an active part of the positive changes happening in their children. 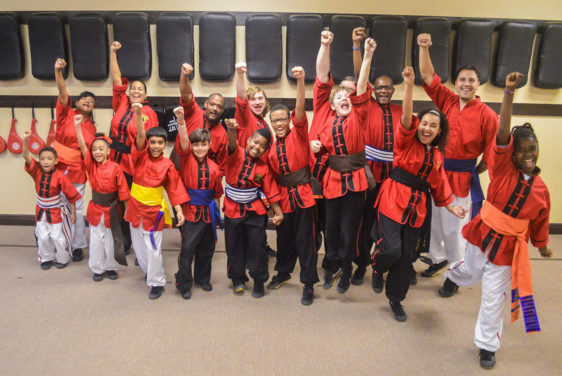 Additionally, martial arts provides youth and parents alike with physical fitness, improved balance and coordination, and potentially life-saving self-defense skills. There’s no better time than today to start seeing these positive benefits in your family. Contact Quest Martial Arts for a free, two-week trial.